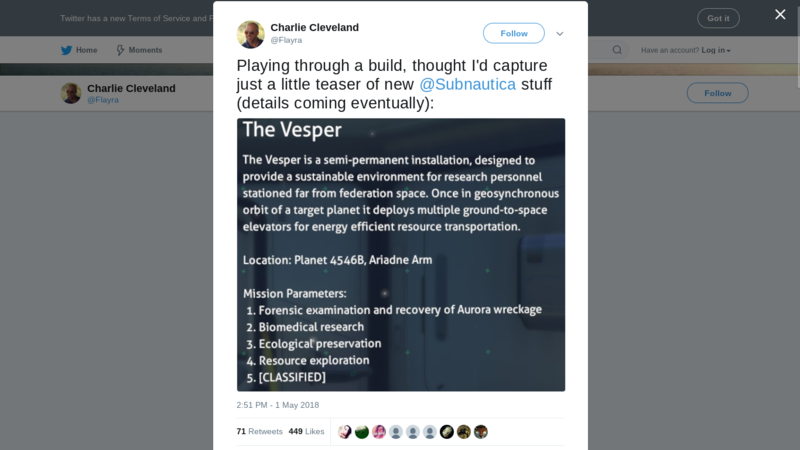 I haven't watched many videos, so, sorry if I missed something, but one of the Subnautica devs (@Flayra) posted something on twitter about a space station known as "the Vesper." This is what he posted. 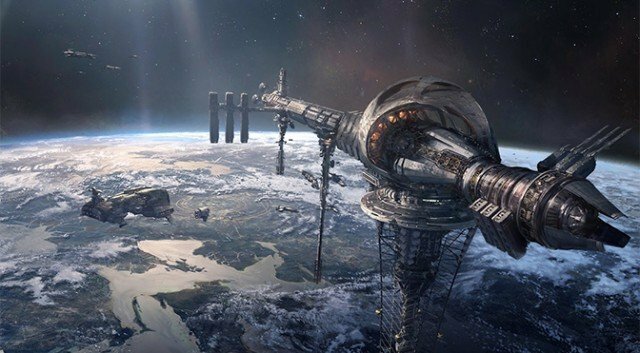 Now, I know that this might already be out of date (they have already replaced the "space elevator" with a rocket) but, what are your thoughts about it? How would it be implemented, and what would it be used for? They might use phasegate technology to get people from the planet to the surface. A physical structure to space would be massive and would have to peirce the atmosphere itself to get to space. Dude, they should just make an orbital 3D-printer drone off of your orbital facility and then one at your base which have like really long-range printing beams. They just construct segments of tubes made from who knows what about the player which protect them from radiation and then suspend the actual player in that green shiz which the precursors use for their turbolifts. The tubes don't even have to be solid, just something which can hold the green stuff in. Maybe the printers suspend the stuff in a magnetic field sustained by tiny nanobots floating in the air. I mean- who doesn't want an atmospheric turbolift? I liked the space elevator, too. They're not a new idea, but still less cliche' than rockets. I agree with @kingkuma and @elfcrisis. 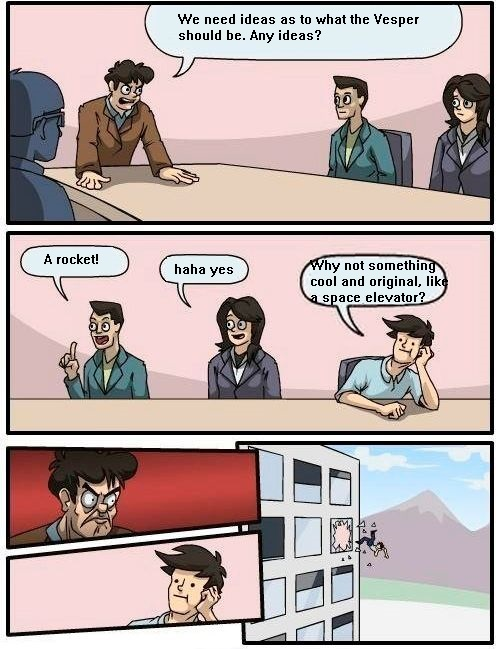 Space elevator would be cool. Just imagine riding a giant transparent tube into space! However, it would be impractical. A giant elevator would have to be very stable, not to mention very strong. Also, wouldn't the space station be orbiting the planet? Then, in order for the elevator to work, either the station would have to stay still, or you would only have a short period of time to use the elevator once it came down. Still would be cool though. Can someone in the know elaborate if a station at the top of the elevator as show in @VectorMaster22's picture can even stay in orbit at what appears to be ISS altitude, while orbiting at the speed of the axial rotation speed of the planet? Not someone in the know, just my one cent. Maybe the planet gravity is weaker, or it is rotating very fast. Or maybe it's using some sort of constant propulsion, but then it isn't orbiting, more like flying. Anyways, I do not understand space elevators logic. It is like magic, same as electrons and airplanes. With nano-technologies, creating a material strong enough to withstand the forces going on with the space station being connected to a planet isn't 100% impossible. However, it is certainly out of society's current technological abilities. It might be possible in the future, where Subnautica takes place in, which is probably why it was considered in the first place. I'm pretty sure that phasegates are supposed to be used on the industrial scale, meaning that they are really big, and they are only used by spaceships. I don't 100% know if this is true. Wouldn't a space elevator also be mostly used as a cargo transport system to get stuff of the planet right, surely that would be used on industrial scale mostly. Yes they are MUCH slower, but they are so much more cost effective. And factories, unbeknownst to the government, have this magical thing called "resupply schedules". And if by some odd occurrence they run out, they call in the tried and proven freight supply trucks. It is possible that the human phase tech requires the portal to be in space, away from "deep" gravity wells. Therefore building on a planet surface wouldn't be possible. An elevator still looks like too much trouble though. If it's just cargo, why not use a huge cannon? A rail gun that shoots cylindrical containers filled with ice-cream to resupply an orbiting space station sounds fun. Geosynchronous order orbit (wow, thanks auto-correct!). A space elevator would consist of a cable with one end attached to the surface near the equator and the other end in space beyond geostationary orbit. The competing forces of gravity, which is stronger at the lower end, and the outward/upward centrifugal force, which is stronger at the upper end, would result in the cable being held up, under tension, and stationary over a single position. A space elevator would require super strong materials, like carbon nano-tubes or something. We can't make these yet, but we're probably not far off, like a couple of decades at the most. I think it can be assumed that these materials exist in the Subnautica universe, and are fairly common. Someone pointed out that a small phase gate, like the kind used by the military, would be cheaper than a huge structure like a space elevator, but we don't know that. With the kind of fabricator technology in common use, churning out the materials for a large structure might be relatively trivial. It could also be that phase gates need much more exotic materials, and/or are difficult to miniaturize. Think of the first Iron Man movie, and how no one could figure out how to miniaturize the arc-reactor technology (besides Tony Stark, of course). Maybe it's just too expensive to make phase gates commonly, and only the military has the budget to use them like that. In that case, it wouldn't be commercially viable for a for-profit entity to use them on anything but a massive scale. i.e. The huge amounts of cargo you ship through them covers the cost of their construction and operation. We also know that materials can be deconstructed pretty easily, so when they're done with the elevator, they could just take it apart and re-use the materials elsewhere. Therefor, a space elevator would be cheaper over time than a phase gate, and probably more efficient than rockets. But just because an idea makes sense, doesn't mean people are going to do it. Just imagine the corporate political infighting over whether to use rockets or an elevator. Someone pointed out that a small phase gate, like the kind used by the military, would be cheaper than a huge structure like a space elevator, but we don't know that. "Cough cough" the military doesn't use phasegates, the TSF does that, and I don't even play Natural Selection "Cough cough" Wow I'm really sick today. "Cough cough" Geosynchronous orbit "Cough cough"
I've never played Natural Selection either, but I just assumed that because the people using the gates were called marines, that they belonged to some kind of military organization. I can't believe I'm offended enough at your pedantry to even respond, but here we are. Pointing out little mistakes like "order" vs "orbit" or my misunderstanding of what the TSF is doesn't contribute to the conversation. Better to let it go, like I should have done instead of writing this post. The "artist" formerly known as the TSA, has always been classified as a guns for hire mercenary force subject to heavy regulations called the Charter, but ultimately they're a self governing entity. I wouldn't call them your garden variety "military" force. They are more of a frontiersmen defense force, specifically trained, equipped and outfitted to combat the Kharaa and as such have various clearances beyond what the civil sector is allowed to do and as such access to advanced technologies, not just limited to phasetech but also the nanogrid. Which is basically a nanite protection system to stop, or rather slow down, the spread of the infestation in it's tracks as long as it is powered by the power grid. Giving the marines their time window to deal with it as soon as the first boots hit the ground. Why not just nuke it from orbit you say, see these facilities are worth a bit too much to merely blow up, so in comes the TSF to solve these "little" problem. An important thing to note is that the Kharaa tends to go into hibernation mode and retreats back to one Hive if it has consumed all the resources (victims and power sources). But as soon as it detects fresh meat, so to speak, it will wake up once more. With the Hive Mind spawning it's defensive creatures and ramping up it's capabilities to meet the threat until it is eliminated and of course absorbed into the Hive Biomass. Funnily enough, the TSF is quite understaffed and under equipped as they are mostly under wraps and kept from the public light. Something they, the various governments, don't want to mention to the public for fairly obvious reasons. In all due respect, I only wanted to point out that you said that the military used phasegates. I don't necessarily know if the TSF is a branch of military in the NS universe, I just thought you were talking about the actual military in real life. Obviously, I knew that you didn't mean it that way, its just a pet peeve I have when people start talking about video games without specifiing that they are talking about a video game. For instance (sorry in advance), I always make fun of people when they start talking about Fortnite, but they don't say that they are, so I just hear "Hey, I killed three people yesterday with my bolt-action sniper!" (Either that, or I have some very messed up friends.) Anyway, sorry about insulting you somehow. "Hey, did you know Thanos dabs?" 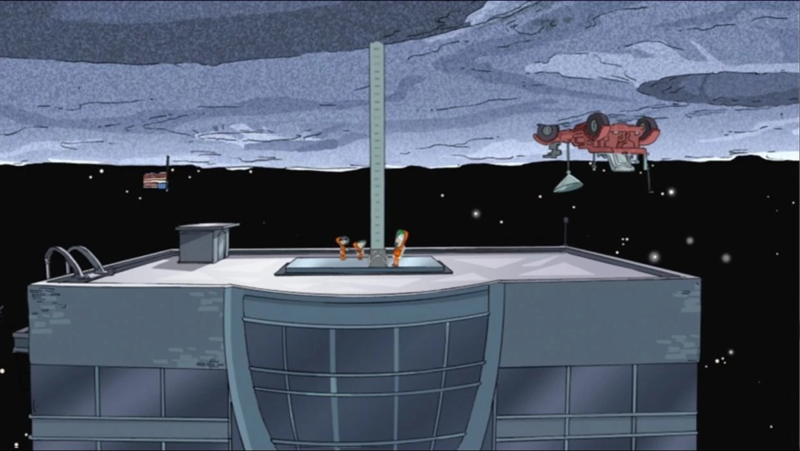 I wonder if the Degasi crew were fooling about up there? The Degasi was a ship manned by a crew of six that crashed on Planet 4546B en route to a space station. The crash occurred around a decade prior to the events of Subnautica, in identical circumstances to the Aurora. Because it needs to be in a geosynchronous orbit (i.e. its orbit will follow the planet rotation, so it will remain stationary relative to the ground). Why an equatorial space elevator? Yeah that's it @Maalteromm. I should have better used the term geostationary orbit rather than geosynchronous (these two terms are often used interchangeably since the equatorial geostationary orbit is the particular kind of geosynchronous orbit most in use for communication and weather satellites). 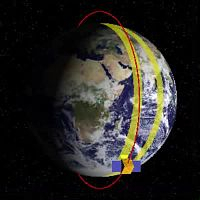 You can see from this gif that, in tems of space realestate, the geostationary options are very limited by the physics: You can vary the up-down altitude, but not the north-south latitude. That's because the centre of a geostationary satellite's circular orbit must be the same as Earth's centre of gravity. So, no regular space elevators in the USA I'm afraid. On the other hand, a skyhook might be a possibility for @jehrek's ice station. A skyhook can be conceived as a space elevator that doesn't quite reach the ground. You could have a skyhook in a polar orbit (see pic below) so its Earthside terminal regularly locates above the same polar location (say once a day). Such an arrangement would indeed be geosynchronous (i.e. syncs up with a place), but not geostationary. But a nice solution though - you'd have to still do some air-freight to the passing terminal, but a whole lot less than we have to now. Addtionally, this skyhook would pass over, not just the Arctic, but every other latitude twice a day. So that would have to be a big plus for us space tourists!